Any Detroit historian or amateur tour guide can probably tell you that Pewabic Pottery, founded in 1903, is one of the city’s oldest businesses, known for its signature glazes that contribute to the unique look of tile work inside the downtown Guardian Building and other iconic Detroit locales, as well as within the interiors of numerous homes throughout the city. What is less readily understood is Pewabic’s ongoing dedication to and participation in the wider conversation about contemporary ceramics in the art world today. If you wanted to take a moment to correct this oversight, might I recommend beginning with Timeless, a two-person show featuring A. Blair Clemo and Blake J. Williams, which opened on September 18 at Pewabic Pottery and features two distinctive and engaging takes on ceramic art objects. 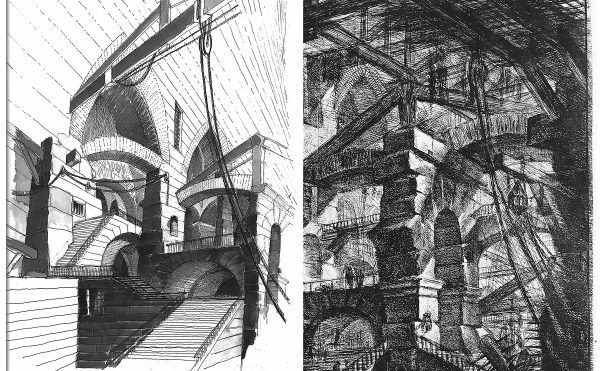 One of Clemo’s pieces, showing the hybridization of classical/decorative ceramic, rough hand-modeling, and industrialized pottery. Clemo’s works address the contemporary side of ceramics through conceptual interventions with classic forms, rendering traditional European decorative / functional objects such as plates and teacups in a manner that undermines their usefulness or reveals the imperfect hand of the maker. Most practiced potters are capable of nearly assembly-line production of simple, repetitive forms; Clemo’s clear mastery of the technique of reproduction set the stage for his conscious violation of the expectation for a ceramicist to produce consistent-looking use objects. 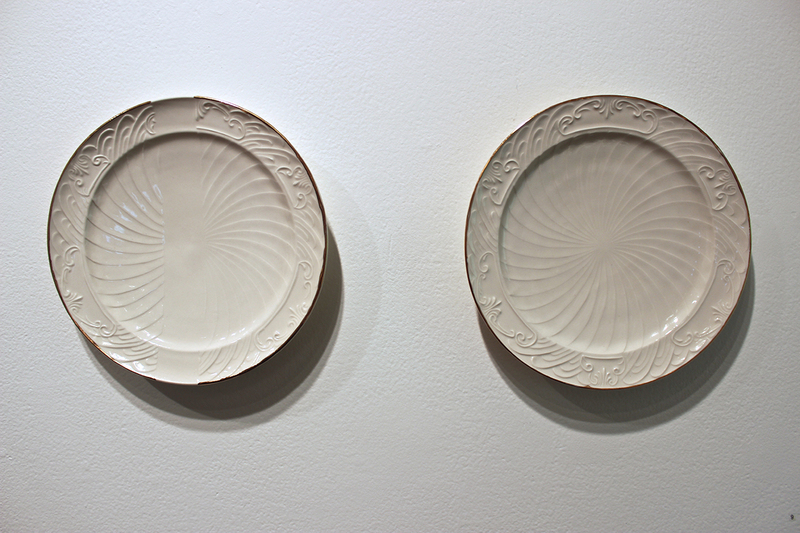 In two serial works, “Hand/Handles” and “Timeline,” Clemo presents sets of objects — decorative urns and dinner plates, respectively — that are ostensibly the same but display an array of differences and “mistakes” in their finishing details. 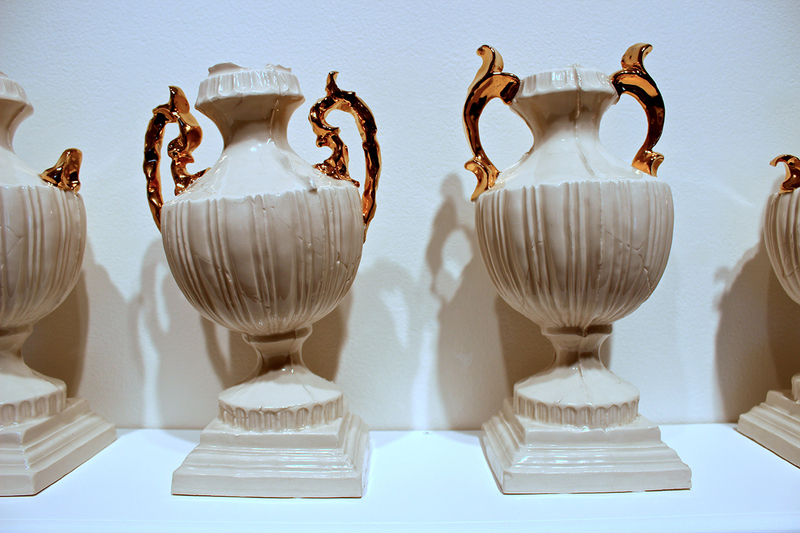 These scarred pieces, featuring malformed or broken handles and swaths of missing surface embellishment, are canonized with metallic detailing and glossy finishes, as though to venerate their flaws and celebrate their differences, their apartness, their freedom from the constraint of being identified as objects for use. 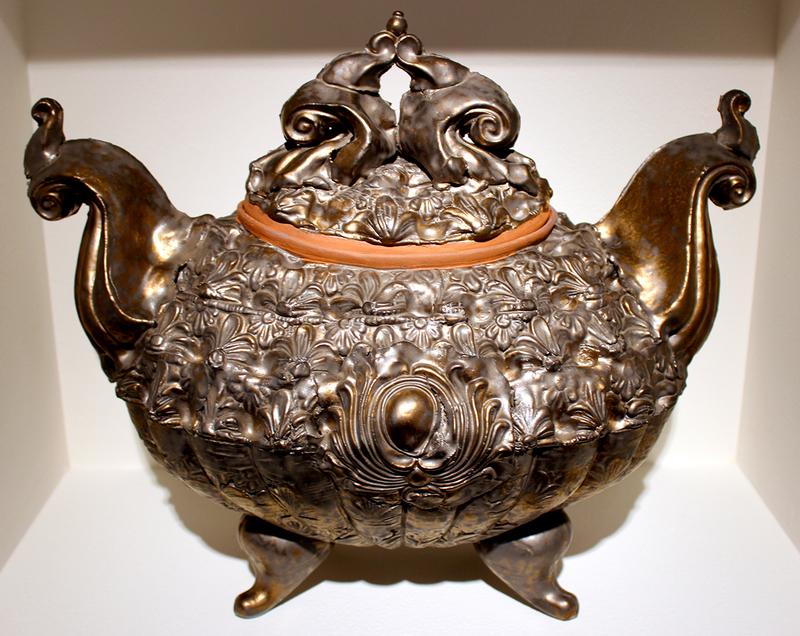 Clemo also uses metallic finish to demonstrate his virtuosity with decorative modeling — the red stoneware piece, “Tureen,” could easily be mistaken for a finely wrought metal work, even at close range. Domestic objects and their ties to identity is a unifying theme between Clemo’s works and those of Williams, who also employs object repetition on a mind-boggling scale that speaks to her roots as a trained potter. 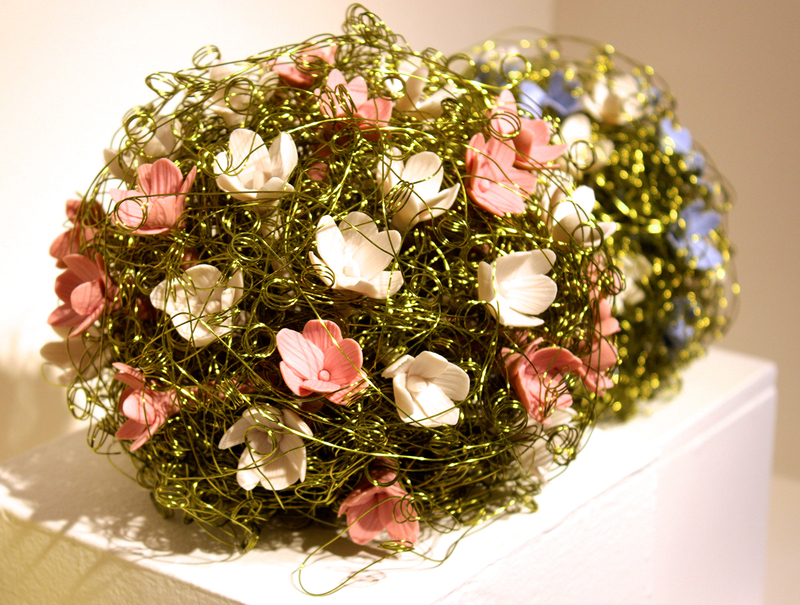 The majority of her works are wire-and-porcelain flower arrangements, which Williams sees as symbolic of the hope and fragility of life. These pieces, which at first seems decorative but become increasingly complex the longer you look at them, include “flower balls” — selections from her dated Summer Series — and an extraordinary floor display in the round, “Resilience II,” which measures four feet in diameter. 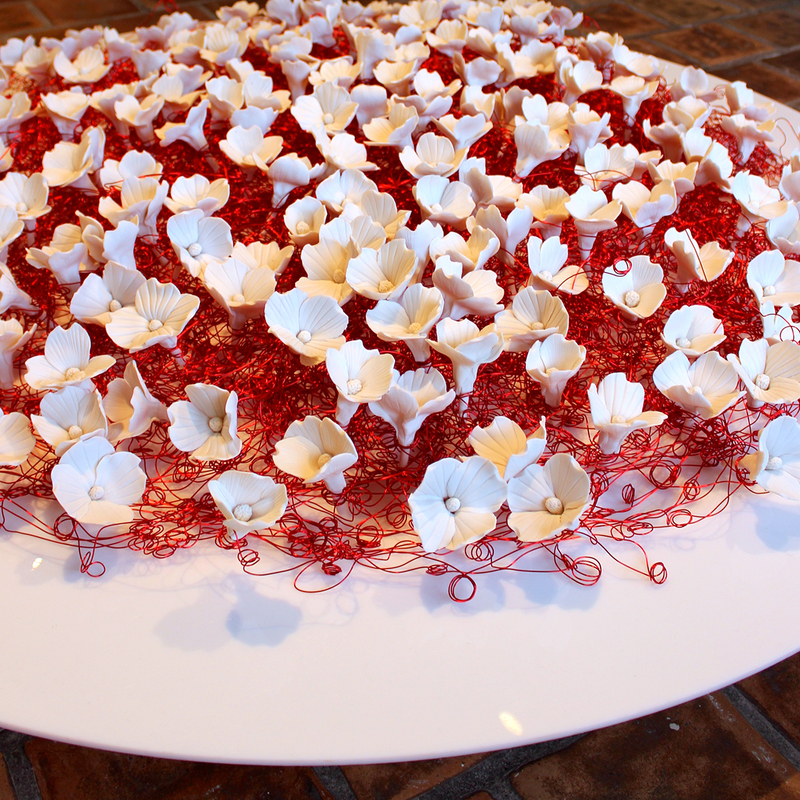 Each piece includes dozens of Williams’ unglazed porcelain dogwood blossoms, which she hand-molds using a traditional technique learned in China, yet the scope of production for these works pales in comparison to her astonishing installation objects of wire and porcelain “beads” modeled after finger bones. Williams created these works in meditation on the concept of inheritance and her conviction that objects retain the energy and memories of their owners, a quality even more enhanced if the objects were initially made by hand. 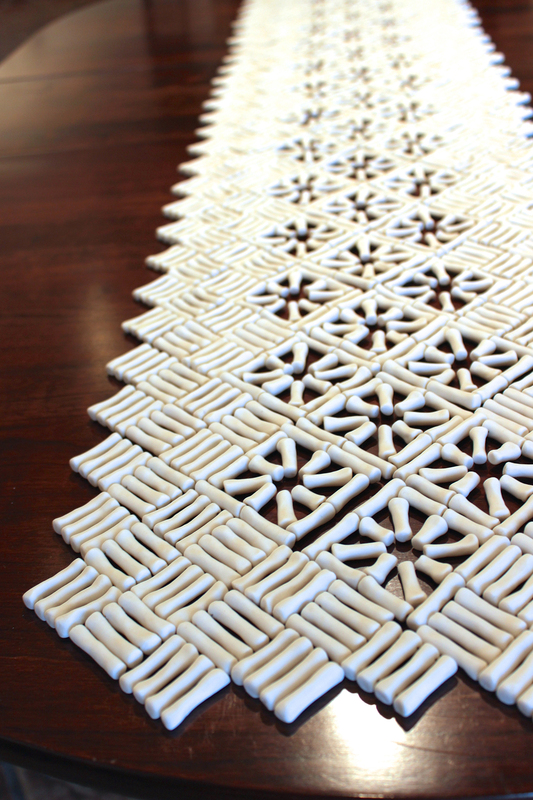 In a literal translation of “handmade,” Williams rolled and assembled hundreds of sets of index finger bones, arranged in tight geometrics to resemble her grandmother’s lace table runner and sized to fit exactly atop a finely refinished table that she inherited from her parents. 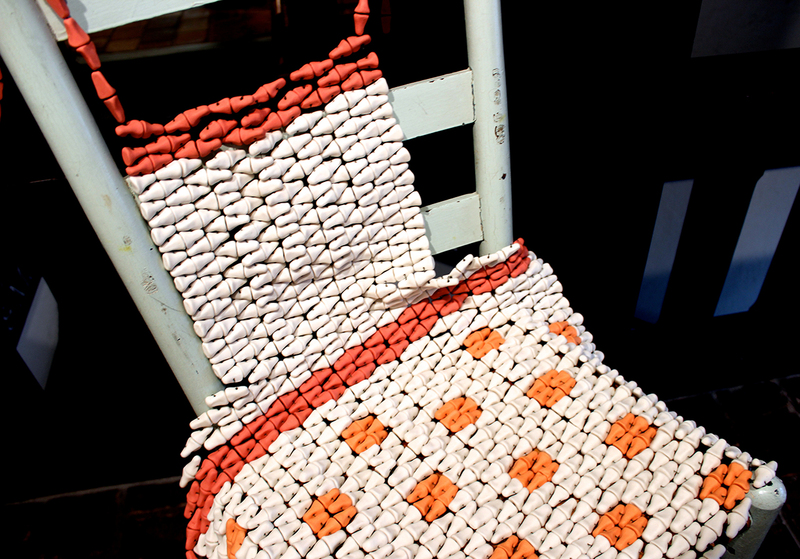 In “Nourish,” an apron comprised of porcelain thumb-tips drapes stiffly over an antique chair — another family hand-me-down — alluding directly to Williams’ line of inquiry into domestic objects as signifiers of often unspoken labor. Williams’ “flower balls” gain visual density the longer you look at them. 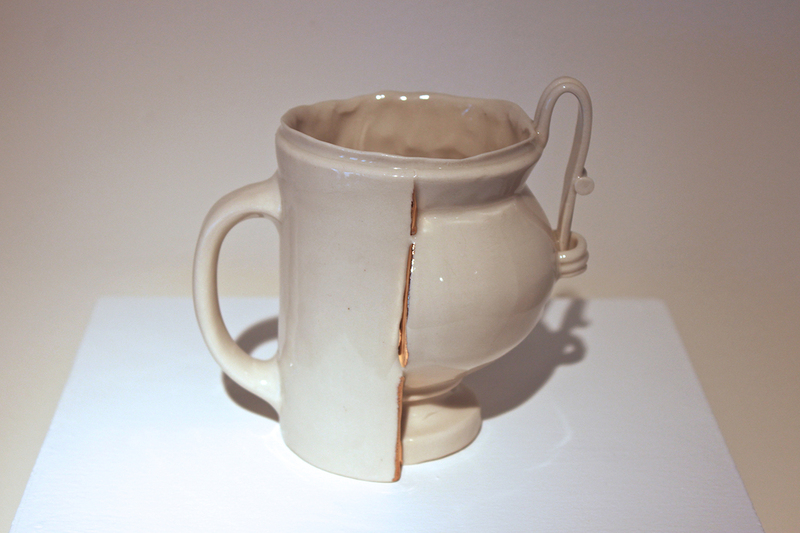 Whether it is Clemo, with his violated use objects, or Williams, investing painstaking traditional labor into a multitude of simple, decorative forms, both artists are making strong contributions within the continuum of contemporary ceramics, calling for recognition, even in the context of Pewabic’s history as a business, of the conceptual value of the form. Timeless is on view at Pewabic Pottery through October 25.